An advisory panel of metro leaders endorsed a Metropolitan Council plan to hide light-rail trains in tunnels through a recreation area. Over the protest of Minneapolis, metro leaders signed off Wednesday on a $160 million plan to hide part of the region’s biggest light-rail line in tunnels through a recreational corridor in the city. Minneapolis Mayor R.T. Rybak cast the lone no vote among 16 mayors, county commissioners and other leaders. He deplored a lack of alternatives to the tunnels and questioned whether they would harm the city’s lakes. “I don’t believe we have put to bed the question of what impact this could have on the chain of lakes,” Rybak told the other leaders. But he also left open the possibility of eventually accepting some version of the project, pledging to “stay at the table” as the plan moves forward over the next few months. The endorsement of the tunnel plan by the advisory panel of metro leaders sends it to the Metropolitan Council, the agency overseeing the project, for approval as early as next week. The decision ends one divisive chapter in the Southwest Corridor project and likely opens another if the Met Council approves the plan and seeks the consent of Rybak and other Minneapolis officials who have come out against it. The agency is required by state law to seek the consent of the five cities along the route, as well as Hennepin County. A refusal by Minneapolis could stall or jeopardize the project. Rybak had some allies Wednesday in Hennepin County officials who asked other metro leaders to keep open the option of rerouting freight train traffic to St. Louis Park to make room for the light-rail line next to bike and hiking trails in the wooded Kenilworth corridor of Minneapolis. Rybak and county commissioners maintain that planners ignored promises over the years that the freight would be rerouted in exchange for running the light rail through the corridor. Dorfman said shutting the door on rerouting the freight trains could leave the tunnel plan “dead on arrival” when seeking the consent of Minneapolis. But she and others with misgivings ultimately voted in favor of the project, saying the line from downtown Minneapolis to Eden Prairie planned for more than a decade would bring jobs and other economic benefits to the west metro region. “It would be irresponsible to walk away from it now,” she said. Hennepin County Commissioner Peter McLaughlin, who also pressed for more freight reroute options, struck a similar tone. “We can protect the trails, we can protect the green space,” he said. The plan involves digging nearly half-mile-long tunnels on either side of the water channel between Lake of the Isles and Cedar Lake. The trains would climb out of the tunnels and cross a bridge over the channel in a 360-yard stretch where they would be exposed for roughly 20 seconds. The $160 million tunnel option was deemed less disruptive than both more- and less-costly alternatives, including rerouting the freight trains to St. Louis Park at a cost of $200 million. But it faces fierce opposition from some in Minneapolis who say the trains surface for too long and who distrust assurances that bike trails and lakes will be preserved. The Met Council says the tunnel plan is preferable because it keeps existing freight traffic in the corridor while hiding the future light rail most of the way. About 220 light-rail trains would use the corridor daily along with several freight trains that currently run through it. If the freight were rerouted, the light rail would be built at ground level through the entire corridor. Rerouting freight to St. Louis Park would have required removal of 30 properties there. Keeping the freight in Minneapolis and burying the light-rail line nearby would spare those St. Louis Park properties. It also would spare Minneapolis townhouses that would be razed to make room for the transit if it were built at ground level next to freight tracks and recreational trails in the narrowest part of the corridor south of Cedar Lake Parkway. But the tunnels wouldn’t be bored from underground; they’d be dug from above and covered, work that would require removal of 1,000 trees and temporary relocation of the bike trails during construction. St. Louis Park and some of its residents actively opposed the freight reroute, which would have put trains on two-story berms in the suburb. The tunnels that evolved as an alternative would bring the total cost of the project to $1.55 billion, up from $1.25 billion earlier this year. 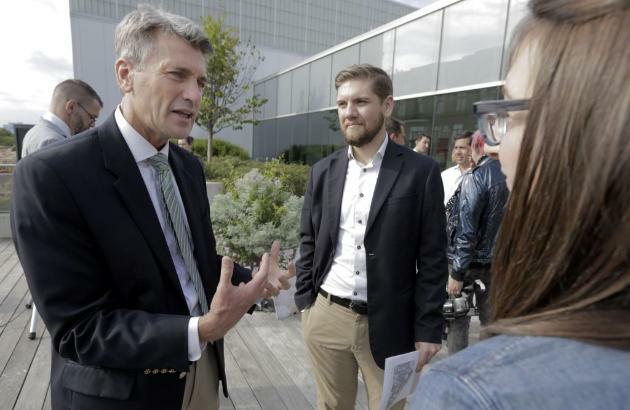 Rybak told fellow leaders Wednesday that Met Council assurances haven’t convinced him that the construction and operation of the tunnels would safeguard the levels and quality of water in the channel, Lake of the Isles and Cedar Lake. Susan Haigh, chairwoman of the Met Council, cited a hydrologist who wrote that he “does not have serious concerns” about the impact of the tunnels on lake water or groundwater. After the meeting, he declined to elaborate on what he meant by staying at the table or the prospects of the plan being adopted. After the meeting, Haigh declined to say whether her agency would try to impose a plan over the objections of a city. The state law on consent spells out a complicated give-and-take process in which cities withholding approval can suggest amendments to a Met Council plan that set the stage for negotiations over several months. But the process could seriously delay the project and threaten its future. This entry was posted in Southwest LRT on October 11, 2013 by citoyen1789.